AKC logos and color standards for Show, Hunt Tests, and Field Trials are our specialty! Our rosettes have large 2 1/4" centers and 1 3/8" pleated ruffles. All side streamers are printed with placements at no additional charge! 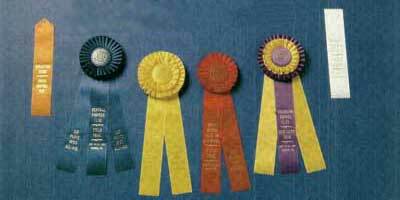 There is no setup or line charge when you order a minimum of 20 ribbons or rosettes. These shiny satin ribbons have all event information in gold letters. We package your order by stake/class, poly-bagged on cardboard, so your rosettes will arrive in good condition and be easy for you to distribute.